The original North Shore swim race, the North Shore Challenge, germinated in 1983. 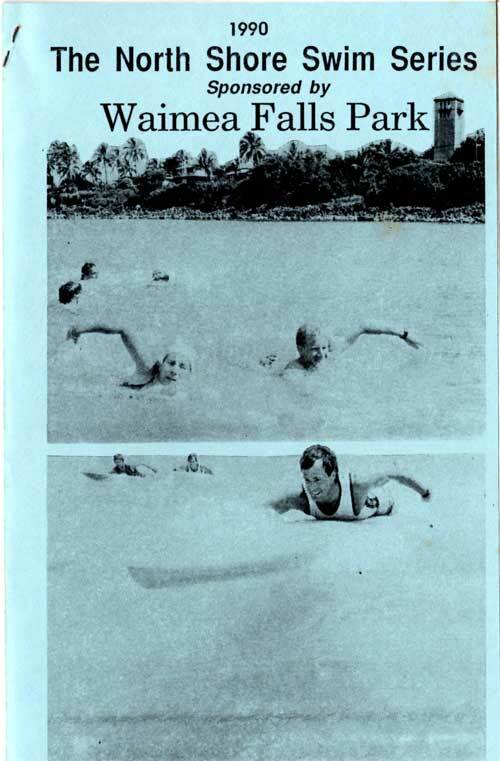 Waikiki Swim Club member Ian Emberson, who lived in Kailua, but swam frequently at Ala Moana, thought that a race out in the clear North Shore waters would be a good idea. He got together with Mark Cunningham, an experienced waterman and lifeguard stationed at Ehukai Beach Park, and they planned the course. Ian's idea was to start at Sunset and end at Waimea, but it was decided a 2.5 mile race, starting at Ehukai would be more popular. Race day attracted just under 100 entrants, with lots of big swimming stars from town. Mark Cunningham outsmarted them all, swimming a hug-the-shore course he had practiced many times, while those from Honolulu headed out to sea. Today, the North Shore Challenge draws almost 300 participants, and many people came out to do practice swims in these beautiful waters. The Bay to Lani's came about in 1987 when swimmers Atomman Kimm and Christine Andrews were discussing the possibility of a "Tour de North Shore" series. The idea of continuing down the coastline seemed appropriate, and Andrea Woods, a North Shore resident who often swam the 2.3 mile distance from Waimea to Laniakea suggested that course. Hawaii Swim Club Masters decided to organize the race, and to spice it up, a fastest combined time award (for the North Shore Challenge and Bay to Lani's) was offered. 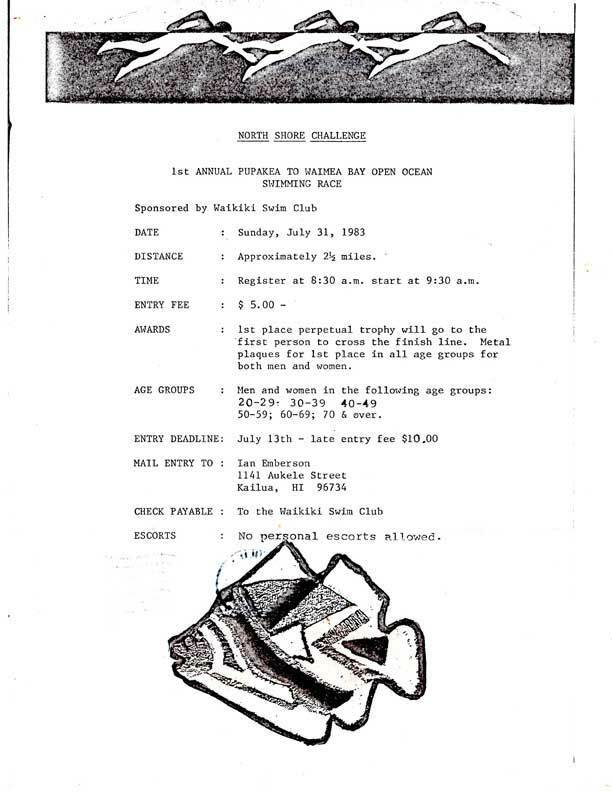 The North Shore series was rounded out in 1988 with two short races. Kalaheo Sports Productions, headed by John Clark of "Beaches of Hawaii" fame, organized the 1 mile Summer Sprint, from Sunset Beach to Ehukai. Another sprint in Waimea Bay was dreamed up by swimmer/paddleboarder Chris Moore, who started the Waimea 2000 with the help of the USLA in 1988, and now is organized by the Rainbow Aquatics Swim Club. This race completes the North Shore Swim Series, and a fastest combined time award is given to the top three male and female finishers.